J. Crew: 35% off dressed up styles w/code READYTOPARTY- A velvet jumpsuit with the cutest back, this sweater dress looks so comfy, a velvet printed skirt and a velvet and leopard dress, yes please! Shopbop: The Big Fall Sale, up to 40% off- This bag is so cute, we are obsessed with these mules, love this paisley blouse and we each have a bag that’s similar to this and it’s a favorite for us all! Nordstrom: Fall Sale, save up to 40% through November 18- Love this long teddy coat, if you’ve had your eye on these rain boots, now’s the time to get them, a crop pullover in three colors and we have this top and thinking we might need to get it another color. Anthropologie: Freshly cut- The cutest luggage tag (a great gift! ), with how cold it’s gotten in Dallas we’re needing to stock up on pullovers like this one, love these booties and the most adorable lamp shade! Our first gift guide of the season – gifts for the homebody! A quick update on where we are on the house. 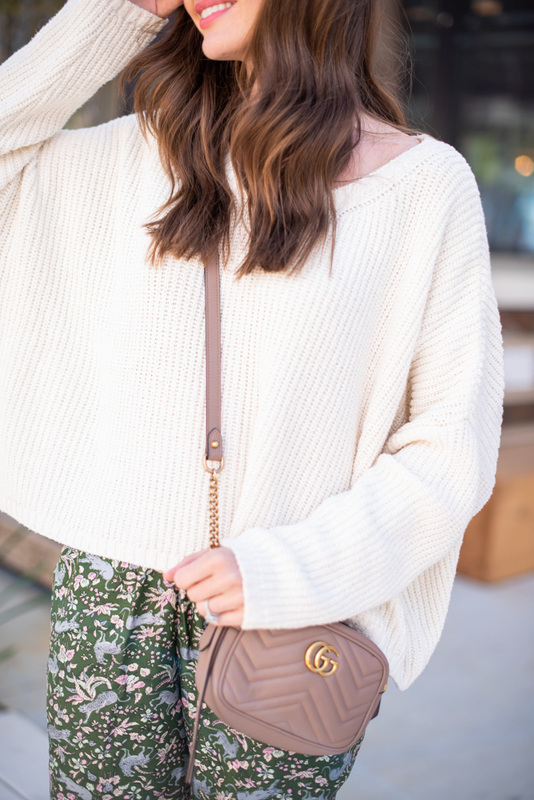 The cutest heart sweater – perfect to wear for Thanksgiving! Stia is eyeing this rug for her breakfast room, loving the colors and the great price point!